Four Russian officers detained in Georgia have been charged with spying, Georgian officials have said. A court in Tbilisi ordered all four officers to be detained for two months pending investigations. Russia has recalled its ambassador to Tbilisi after Wednesday's arrests and has begun a partial evacuation of its staff from Georgia. Georgian President Mikhail Saakashvili has described Moscow's reaction to the arrests as "hysteria". In a separate development, Russia's ambassador to the UN has called on the Security Council to censure Tbilisi for "dangerous and unacceptable" actions in Georgia's breakaway Abkhazia region. Relations between Moscow and Tbilisi have deteriorated in recent weeks, since Georgia and the Western military alliance Nato agreed to hold talks on closer relations, correspondents say. On Friday, Russian Defence Minister Sergei Ivanov accused some new Nato members of illegally supplying Georgia with Soviet-era weapons. He did not name the countries. Nato appealed to both sides to defuse the crisis. The four Russian officers were formally charged at a preliminary hearing in the Tbilisi court. The court also ruled that seven Georgian nationals accused of treason should be detained for two months. Georgian police are still surrounding a Russian military HQ building in the capital. They say another Russian officer they want to question is sheltering inside. A Russian contract serviceman who was detained together with the four officers has been released, Georgian and Russian officials said. Georgian officials have shown video footage which they say shows the Russian officers discussing military installations with Georgian citizens and exchanging money. But the Russian ambassador said the evidence made public so far was not proof that the Russian officers were spies. Tbilisi has also linked them to an attack in the town of Gori which killed three police officers and injured dozens of people. The Russian defence minister said the charges against the officers were false and were intended to divert attention from Georgia's internal problems. On Thursday, Moscow said it was recalling its ambassador, and ordered a partial evacuation of its personnel and members of their families in Georgia. The first two Russian emergencies ministry planes with about 100 people on board - including the ambassador - left Tbilisi on Friday. 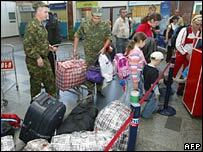 Moscow has also advised Russians not to visit Georgia, and stopped issuing visas to Georgian nationals. Georgia, meanwhile, has accused Russia of actively trying to undermine its government by backing separatists in Abkhazia and South Ossetia. 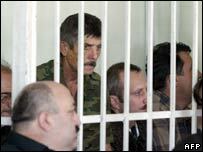 The arrests coincided with the first official visit by Georgian President Mikhail Saakashvili to a disputed area on the border between Georgia and Abkhazia. Tbilisi also says Moscow is waging economic war against the country through embargoes on imports of Georgian products, which Russia denies. Relations between the two nations have become increasingly tense since Mr Saakashvili came to power in 2004, pledging to take the Caucasian nation out of Russia's orbit and join Nato and the European Union.